The Best Health and Fitness Applications for Your Phone. I guess almost everyone has smartphones nowadays, and sometimes we can’t imagine our life without it. This gadget is part of you, and it helps you in many cases. I love to use my iphone for different aplications about health, fitness, exercising, healthy recipes etc. 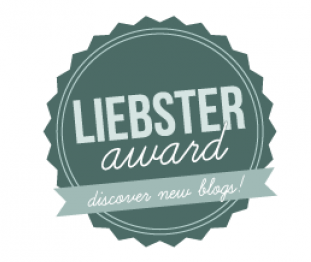 Today, I would love to share with you some that I personally use and find them cool and useful. Reading food labels is important, but it’s also time intensive. Fooducate helps speed things up. Use it to scan an item’s bar, and not only will it offer a quick nutritional rundown, but it will also give the food a grade and highlight important details, such as serving size, GMOs etc. This app is available for iPhone and Android. This is the best app for exercising anywhere: home, gym, travelling. Choose individual workouts, or select a targeted, structured four-week or 30 day program to help you get lean, toned or strong in 30 days. Add running to boost your results. Customize workouts with the drills you prefer. See the results, and celebrate your progress with your friends. Featuring more than 100 workouts by Nike Master Trainers and world-class athletes like Maria Sharapova, with all the instruction and motivation you need to blast through your fitness goals. 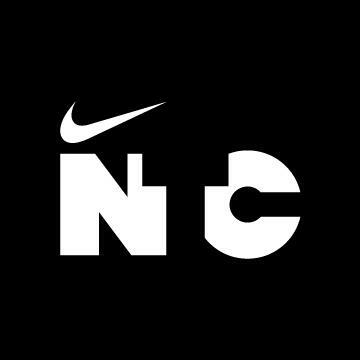 Take control of your training with Nike+ Training Club. Lose weight with MyFitnessPal, the fastest and easiest-to-use calorie counter for iPhone. With the largest food database of any iPhone calorie counter (over 3,000,000 foods), and amazingly fast food and exercise entry, we’ll help you take those extra pounds off! There is no better diet app – period. Channel your inner foodie with this all-in-one kitchen tool kit: import recipes from websites, food blogs or Word documents, then put them in a weekly or monthly menu planner. Tap ‘add to shopping list’ and the ingredients appear on your grocery menu. LOCAVORE is the easiest way to find local, in-season food. Pinpoint nearby farmers’ markets & farms that sell the products you love. 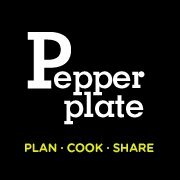 Discover seasonal recipes. Whether you’re trying to eat more fruits and veggies or drink more water, this app can help you reachyour goal. 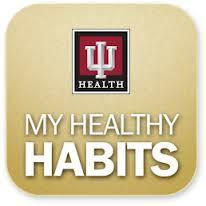 Choose a habit and the program monitors your progress in 21-day increment, sending out reminders, motivational messages and tips to help you stay the course. These are my favorite health and fitness apps. 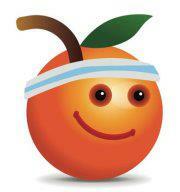 Share what are your favorite health and fitness apps. 5 Super Healthy Foods for Kids. For many parents, buying and preparing healthy foods is pretty easy. 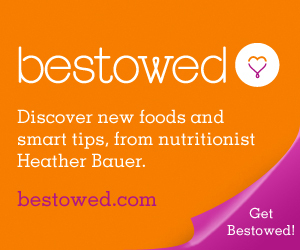 It’s getting your child to actually eat those nutritious foods that’s the hard part! This makes mealtimes frustrating and leaves parents often wondering if their child is getting enough nutrients. If this is the case in your home, then read on because I will tell you about 5 super healthy foods that I guarantee even your pickiest child will eat. This nutty plant food is packed full of Omega-3 fatty acids which are needed for optimal brain development. Flaxseed is sold whole and ground, but research suggests that ground is absorbed by the body better. Try sprinkling ground flaxseed onto cereal or into the batter of sweet treats like Oatmeal Almond Cookies. Replace 1/4 cup of flour with ground flaxseed in your child’s favorite muffin, bread, or pancake recipe to add a healthy boost to baked goods. This spud is one of the most nutritious (and inexpensive) vegetables around. The Vitamin A in sweet potatoes keeps eyes healthy, and acts like an antioxidant in the body. Sweet potatoes are a favorite among babies because of their natural sweetness and bright color, but they are often forgotten once kids get older. Try my sweet potato tots the next time you need a side dish. Apple sauce or a drizzle of maple syrup make good toppings. This heart-healthy dip and spread is one food that most kids will eat – as long as you don’t tell them it’s made from beans! But it’s the fiber, complex carbs, and protein in those garbanzo bean—combined with heart-healthy olive oil—that make hummus such a perfect food. The complex carbs fuel your busy little one, while the protein and fiber help keep him content and meltdown-free until dinner. Serve hummus as a dip with baked pita chips or carrots or use it in place of mayonnaise on sandwiches and wraps. My daughter loves it with veggie burgers or baked potatoes. Avocado is full of monounsaturated fats, the “good” fats that kids actually need in their diet every day. In fact, it’s recommended that 25 to 35% of kid’s calories come from fats, primarily the unsaturated ones. So how do you get your child to eat this creamy green fruit? The easiest way for me to spread on a toast, instead of cream cheese. Toast with avocado my daughter’s favorite breakfast. We like to make quacamole also, but to make it even more nutritional I add some chopped kale. Start kids on avocado early since fat intake is particularly important in the early years. In fact, ripe avocado is a perfect baby food spooned straight out of its peel. One cup of this sweet tropical fruit provides almost a whole day’s supply of Vitamin C which helps keep kids’ immune systems running strong and keeps teeth and gums healthy. It also provides 3 grams of fiber for just around 100 calories. 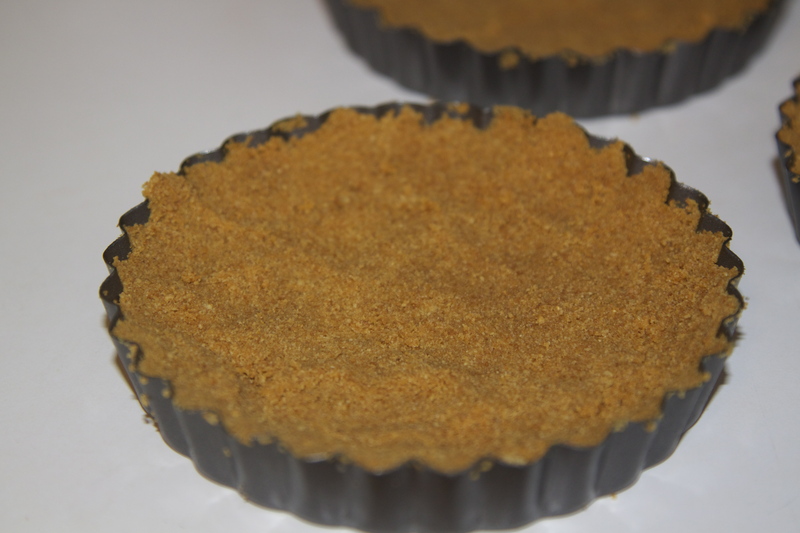 Buy fresh to serve cut up or in dessert like my Raw Mango Coconut Lime Tart. Want a fun way to cool your kids off and provide a nutritious snack? Puree peeled cubes of mango in a food processor or blender; pour into popsicle molds or ice cube trays and freeze. In a few hours, you’ve got frozen mango pops! Here is a comfort kids food recipe that I came with last weekend. 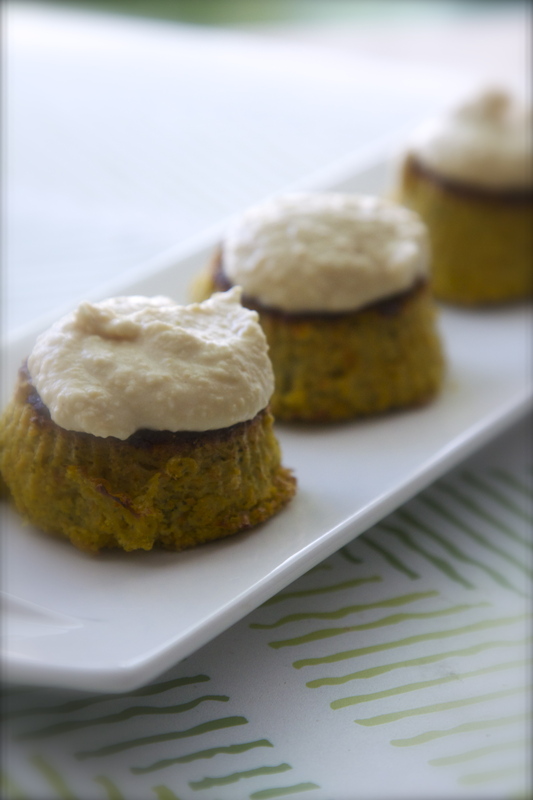 I was planning to make zucchini pancakes, but didn’t want to use any oil, so I made zucchini muffins, which I served with hummus. Sophia loved them, even she got sick, and didn’t have any appetite at all. Heat the oven to 350F. Mix all the ingredients in the food processor. Pour the batter into muffin forms. ( I used silicone ones). Bake in the oven for 30 minutes. Serve warm with hummus or any kind of spread. Vegetarian Tom Kah Thai Coconut Soup. 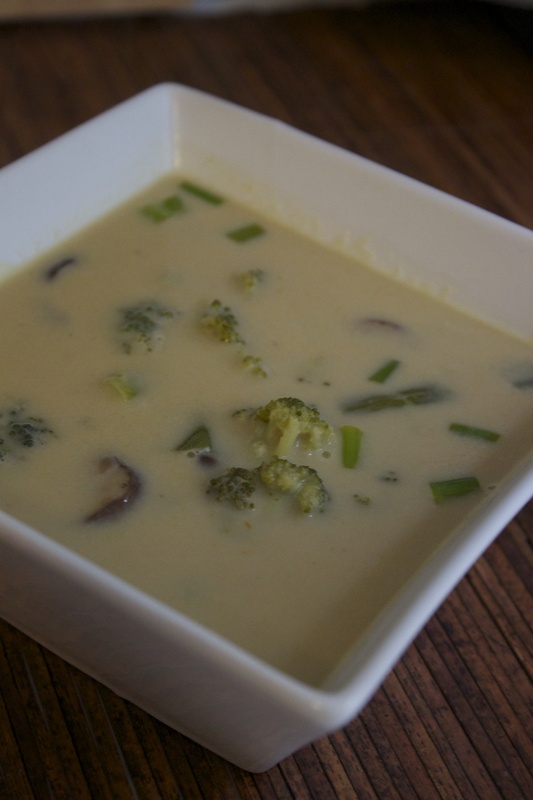 This is a delicious, vegan version of Thai coconut soup. I love making soup, because it doesn’t take a lot of time to cook and you can save leftovers for the next day. My journey with Thai food started in US, and I can say it ended up pretty fast, because I am not a big fan of it. The only dish that I like is coconut soup. They usually use animal or seafood products in their dishes, but this recipe is completely vegan and all the ingredients would be familiar for you and easy to find. The ethic sections of most supermarkets now carry green curry paste. By adding the lime last, you preserve its vitamins and prevent the soup from turning sour. Vegetarian Tom Kah Coconut Soup. 1. Heat the coconut milk and vegetable broth in a large pot, along with the green curry paste and tamari. Bring to a boil, then quickly reduce heat to a simmer. Add the mushrooms, broccoli and scallions, and cook gently for 2-3 minutes, or until they are just slightly cooked, but retain most of their crispness. 2. Remove the pot from the heat and stir in the rest of the ingredients. 3. Ladle the soup into bowl. Optional: Garnish with chopped cilantro. Bananas? This is one of the most popular fruit in the world. You eat it raw, cooked, dry, frozen. Bananas are a good source of fiber, manganese, potassium, and vitamin C. Banana is an excellent source of B6. They help combat diarrhea by replacing lost potassium, and their soluble fiber from pectin helps absorb liquid in the intestines, to better form and move stool. Bananas also contain inulin, a type of soluble fiber that functions as a prebiotic, promoting the growth of beneficial in the gut. There are over five hundred types of bananas. The banana tree is not actually a tree, but a huge herb. It can grow as high as twenty feet tall-as big as a two-story house. They are thought to be the first fruit to be ever grown on a farm. 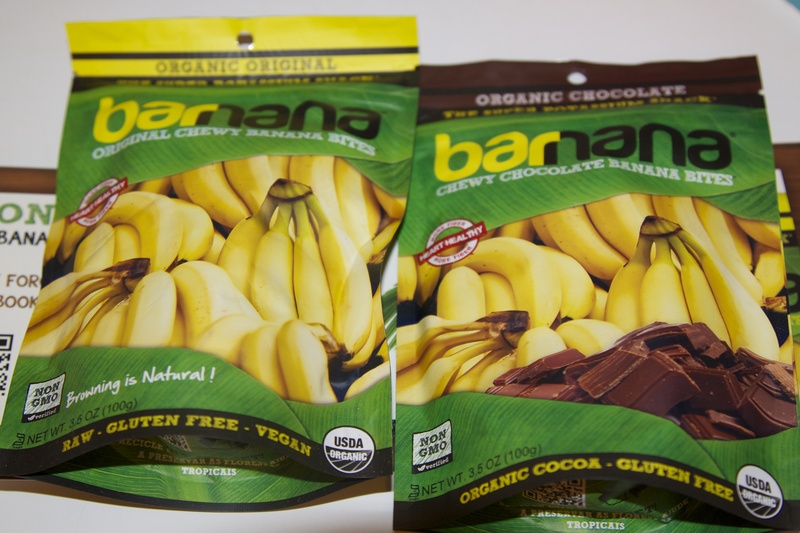 There is a new product on the market, that I got to review recently: Barnana. Original Chewy Banana Bites. They taste as good as it sounds. Chewy, not too sweet delicious banana bites. Which one I like more? Both taste great, but my love to chocolate won!!!! I like everything “chocolate”, that’s why the chocolate one tastes better to me. This can work as an occasional healthy treat, because the bites taste like candy. My daughter loved the original ones. We even took some of them to share with her friends on the play date, and the kiddos approved it. My idea is to use it as a treat for my daughter now. She doesn’t eat any candies, or chocolate, but Barnanas will work as a healthy treat. I didn’t see them at them at our local stores, but their site says, you can find them in Fairway, or order on line. I will definitely recommend to try this delicious healthy snack. Yesterday, we had friends over and I needed to make some delicious dinner with dessert. For dessert I wanted to try something new, something I have never done before, something delicious and guilty free. There are a lot different desserts, but in summer you want to eat light and fresh desserts, so my recipe worked great, because it is not too sweet, with light coconut cream and fresh berries. It might take a little time to make, because it needs some time to stay in the refrigerator, but if you make everything in the morning, it will be ready by dinner time. 10 plain graham crackers. 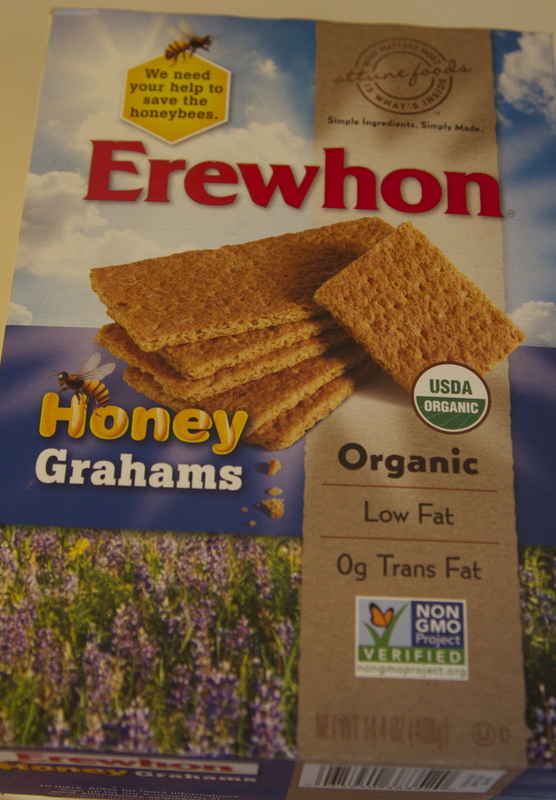 I picked Erewhon Graham Crackers because they are organic and GMOs free, has only 7 grams of sugar, and just a few ingredients. 5-6 tbsp of coconut butter. In a food processor blend the graham crackers into a super fine meal. Add coconut butter and pulse until a crumby dough forms. Divide the dough between four deep dish tartlets pans with removable bottoms and press the dough into the sides. Refrigerate for at least 1 hour. Mix the coconut milk with vanilla and stevia with mixer on high speed for 1 minute. Divide the cream between the tartlets shells and refrigerate until ready to use. 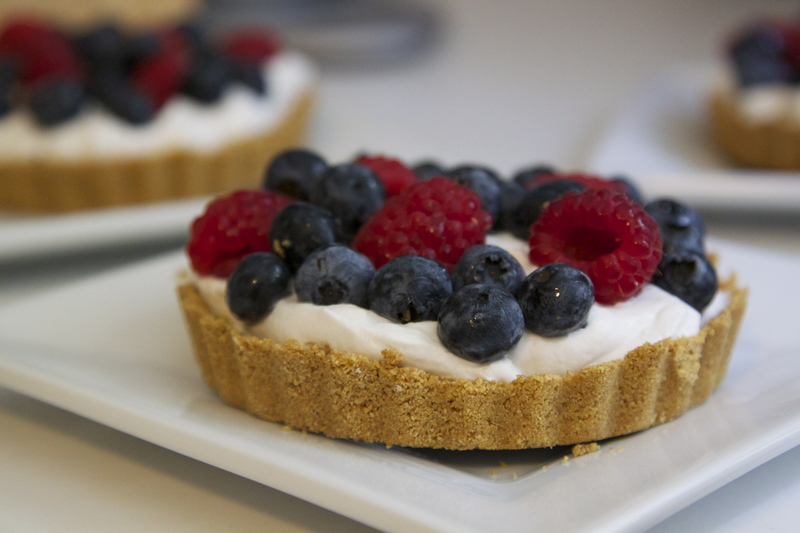 Just before serving, top with berries. Yes, they were really delicious and this combination worked just great: not too sweet, light and fresh.